U.S. 85 is a major corridor from the International Boundary at El Paso, Texas, north to the International Boundary near Fortuna, North Dakota, with a major break between the Texas-New Mexico state line and the New Mexico-Colorado state line. 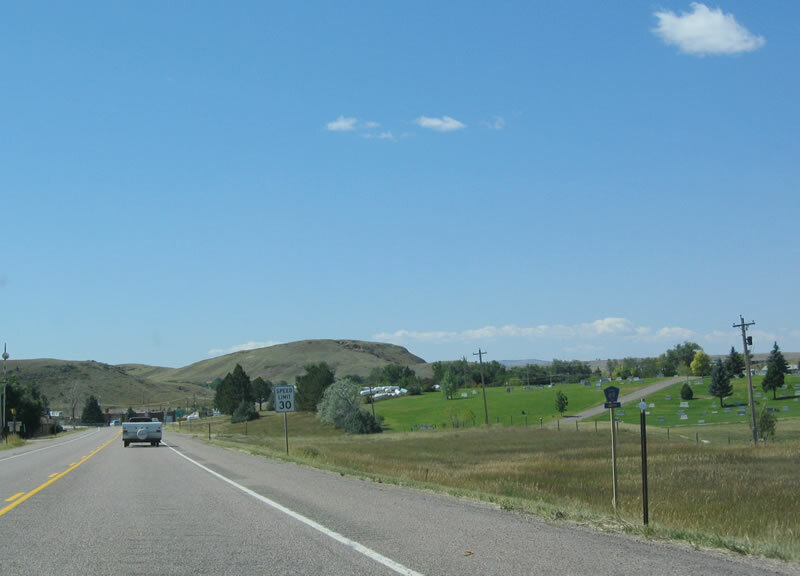 U.S. 85 follows State Control Route 25 for its entire length, from the Colorado State Line north to the South Dakota State Line, with some overlap along Interstate 25 and Interstate 180. 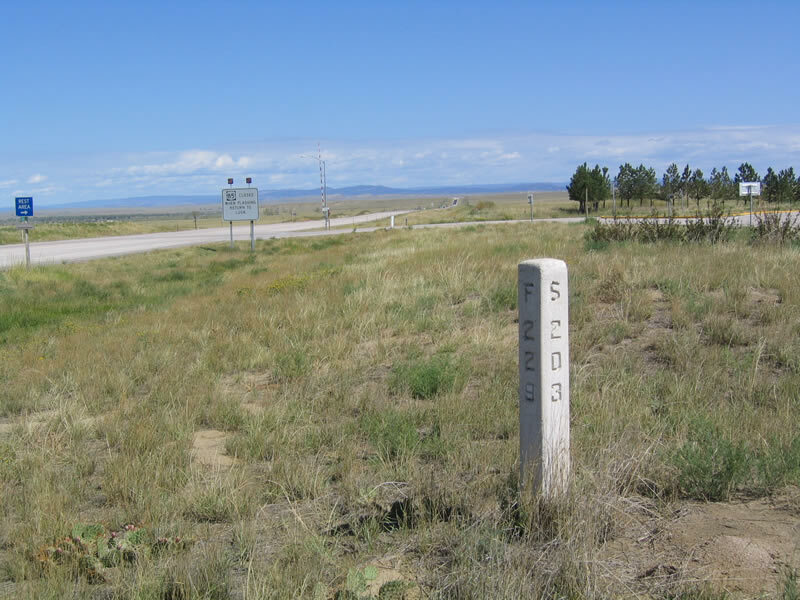 Between the Texas-New Mexico State Line and Colorado Springs, there are no U.S. 85 markers. U.S. 85 emerges (cosigned with U.S. 87) on the Interstate 25 business loop in Colorado Springs. 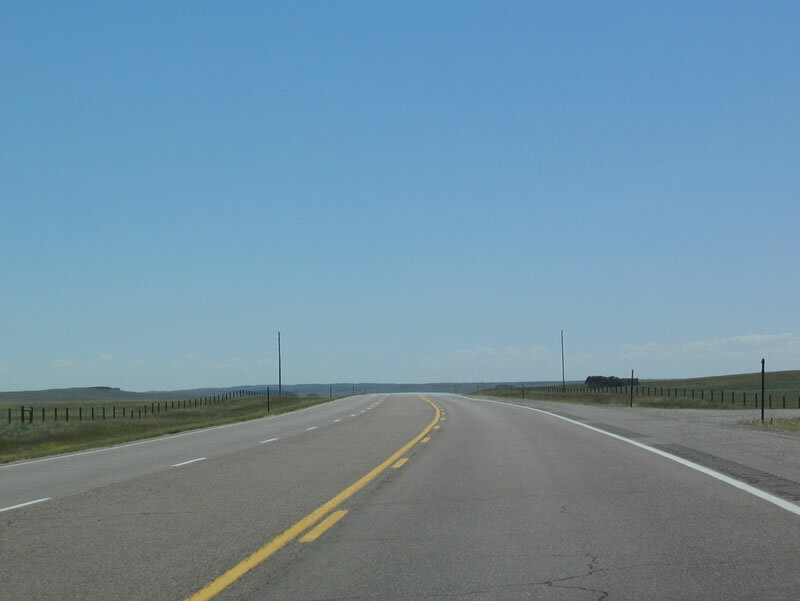 This may be due to the fact that the state of Colorado does not like to sign more than one route designation on stretches of Interstate highway. 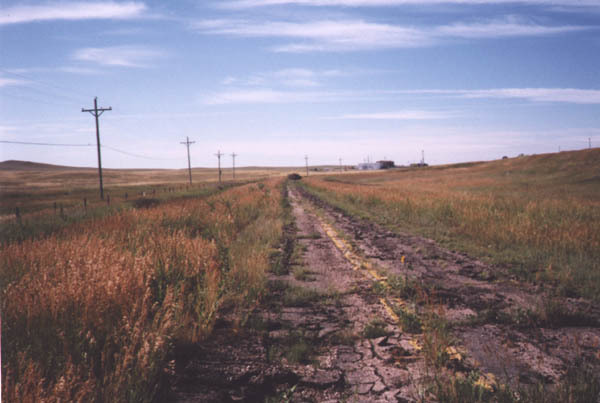 A former route, Alternate U.S. 85, used to begin at Mule Creek Junction and turn east via today's U.S. 18 into South Dakota. U.S. 85A (shown on some early maps U.S. 85E) followed U.S. 18 east to Hot Springs, then headed due north via the current U.S. 385 to Custer and Lead through the Black Hills. U.S. 85A was deleted when U.S. 385 was commissioned in the 1940s. 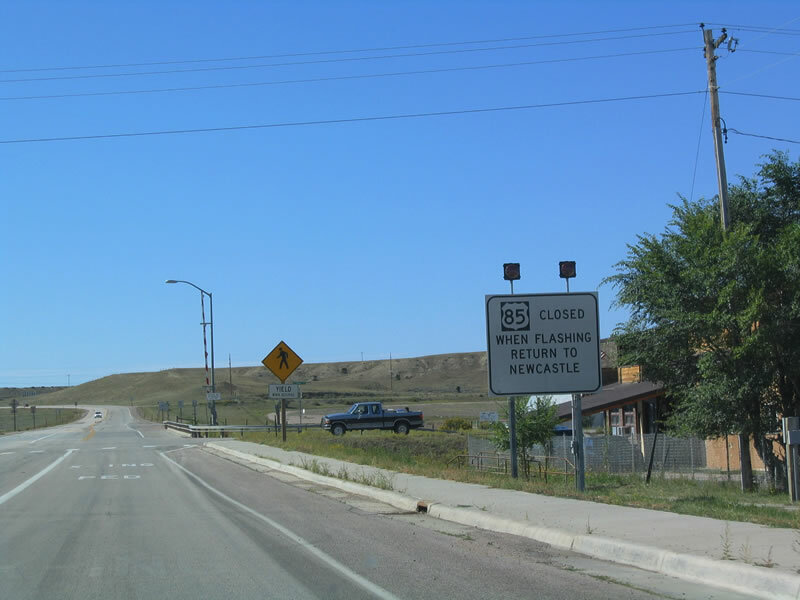 There is no Alternate U.S. 85 in Wyoming today. Business U.S. 85 follows Main Street and Wyoming 92 between 11th Avenue and U.S. 26/East Valley Road in Torrington. Mainline U.S. 85 was rerouted onto a bypass just east of the business loop in 2014. The business route has an at-grade railroad crossing, while the bypass has a grade-separation with the railroad. 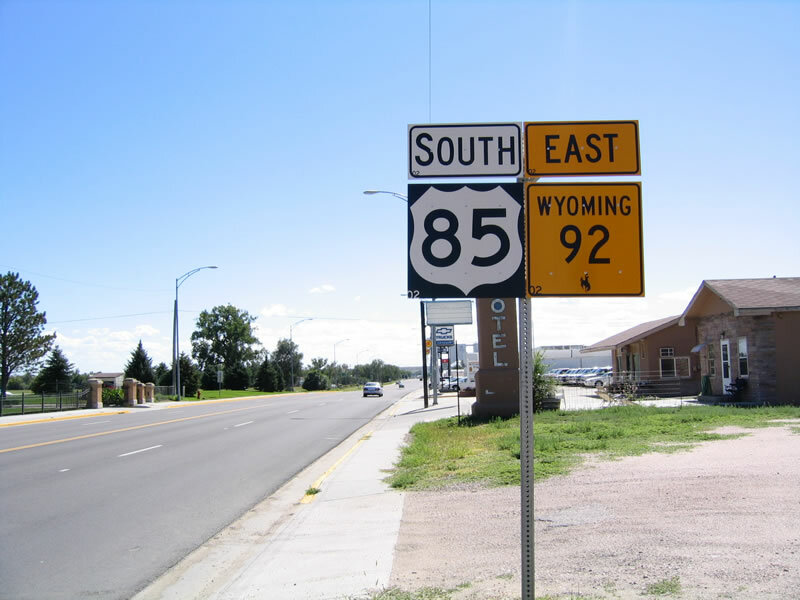 U.S. 85 currently has one state auxiliary route, Wyoming 585. U.S. 85 is an original 1926 U.S. route, with much the same routing today as it had then. 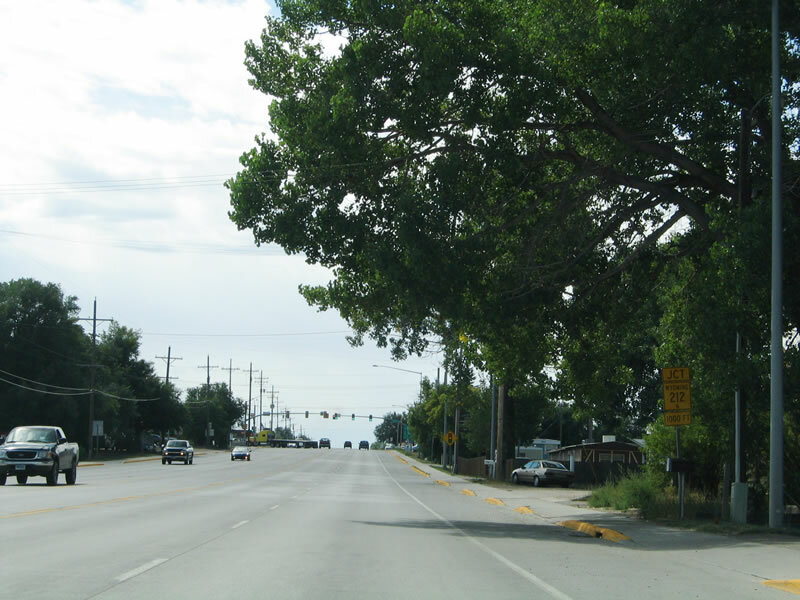 Between 1926 and 1936, there were two auxiliary routes for U.S. 85 in Wyoming: U.S. 185 and U.S. 285. Both of these routes are now decommissioned in Wyoming. An alternate route for U.S. 85 was defined in 1937; this was also decommissioned when U.S. 385 was commissioned to run through the Black Hills of South Dakota. 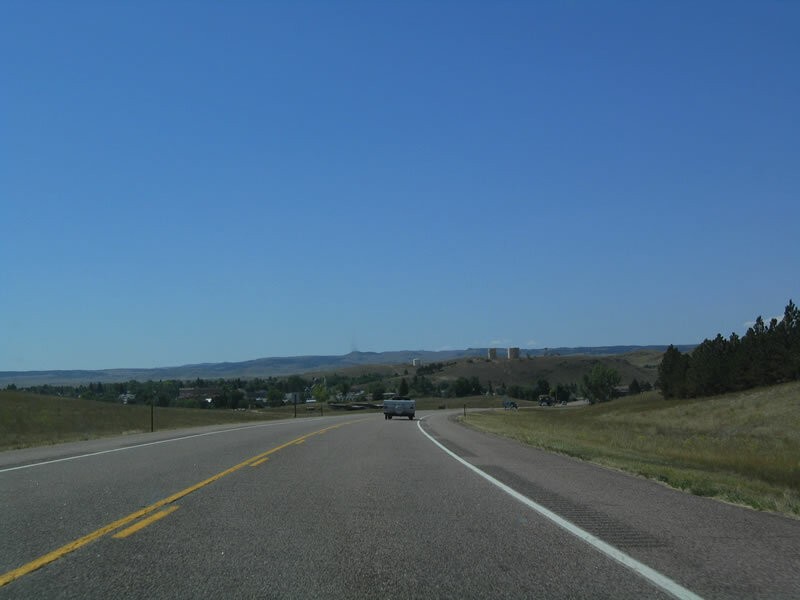 The construction of Interstate 25 in the 1960s and 1970s led to the routing of U.S. 85 between north Cheyenne and its exit from Interstate 25 to be decommissioned to Wyoming 219 near Cheyenne. U.S. 85 was routed onto the freeway. 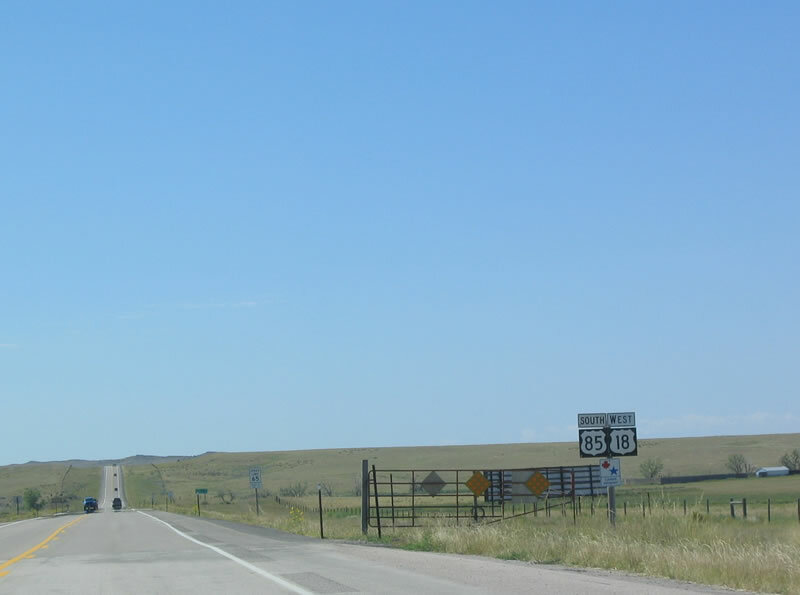 U.S. 85 is pretty much absorbed by the interstates south of Denver, but in Wyoming, it does a better job than most U.S. routes of staying clear of them. It only hits Interstate 25 for five miles north of Cheyenne. 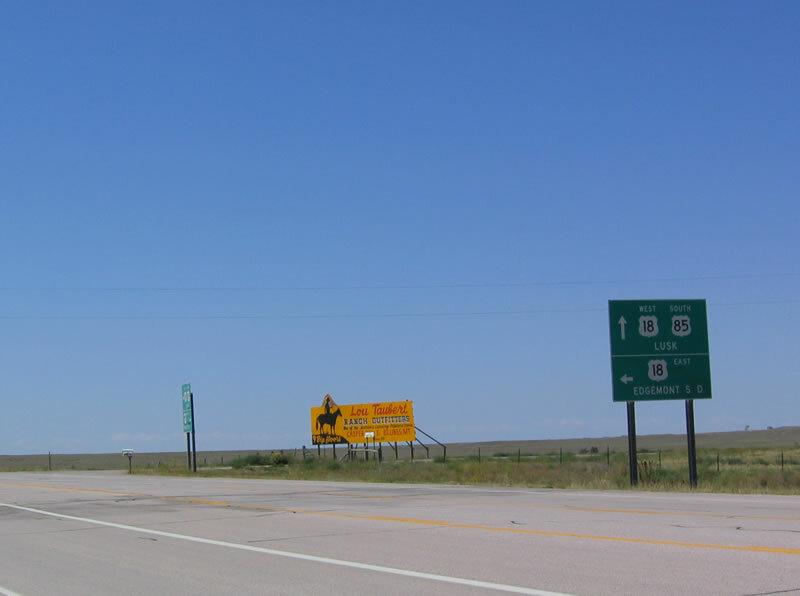 South of Denver, Interstate 25 has mostly replaced U.S. 85 to the point that U.S. 85 is no longer commissioned in the state of New Mexico. A small section of U.S. 85 in Torrington was realigned on January 14, 2014, when a new, grade-separated viaduct opened to traffic just south of U.S. 26. This new route is less than a mile long, and it was constructed just to the east of the original route to avoid an at-grade intersection. 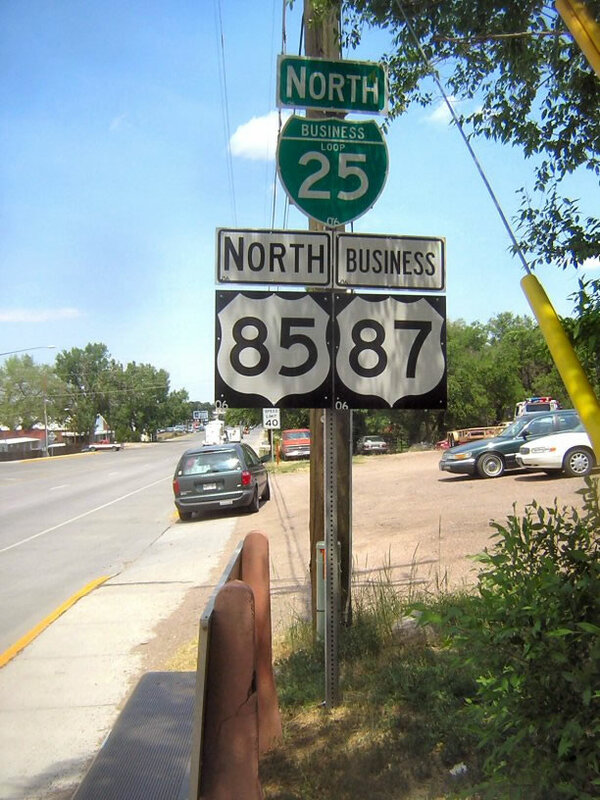 The original route is now designated as Business U.S. 85 and Wyoming 92. 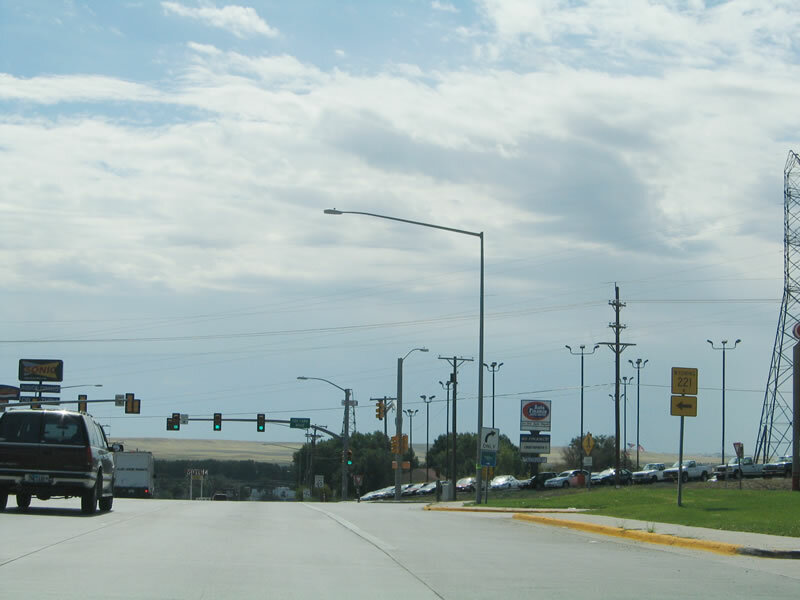 U.S. 85 was considered a candidate for the Heartland Expressway corridor (High Priority Corridor 7) that is now defined to follow Nebraska 71, U.S. 385, and South Dakota 79 near Rapid City. 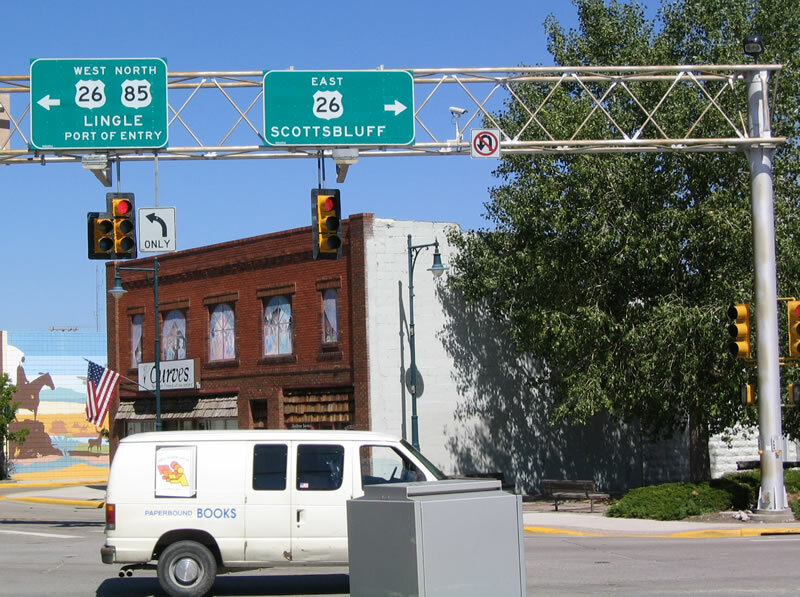 U.S. 85 roughly parallels Interstate 25 and U.S. 87 in the southeastern part of the state, then turns northeast to enter the Black Hills and provide access to the Rapid City, South Dakota, area. The entire route is designated the "CanAm Highway," indicating its importance for travel and tourism. This was the designation used when promoters wanted this route used for the "Heartland Expressway" corridor (now designated by Nebraska 71 and U.S. 385). Much of the land U.S. 85 traverses is rolling rangeland and wheat fields north of Cheyenne. The Goshen Hole and North Platte River Valley tend to have more highly irrigated crops, including sugar beets and corn. Just shy of Torrington, U.S. 85 and Wyoming 92 briefly merge (and separate at the new Torrington bypass), and U.S. 85 turns west along follow the North Platte River along with U.S. 26 for a few miles. At this point, U.S. 85 follows the historic Oregon Trail. U.S. 85 turns north again at Lingle, leaving U.S. 26 behind. It crosses into Niobrara County, which is the state's least populated county. The county seat, Lusk, sits at the intersection of U.S. 85, 20, and 18. This community gained notoriety a few years ago when the entire town was provided with Internet access. Local promoters hope the promise of Internet access will improve business growth in the area, which has been lagging. Now combined with U.S. 18 through Mule Creek Junction, U.S. 85 passes land much less arable than that in Goshen and Laramie Counties. This land is covered with sagebrush, with antelope, livestock, and even windmills in abundance. U.S. 18 parts ways with U.S. 85, and it heads toward South Dakota. U.S. 85 continues north to Newcastle. At Newcastle, U.S. 85 intersects U.S. 16. Folks built this town for the abundant coal, and they expanded it for the railroad. Today it is a gateway into the Black Hills. 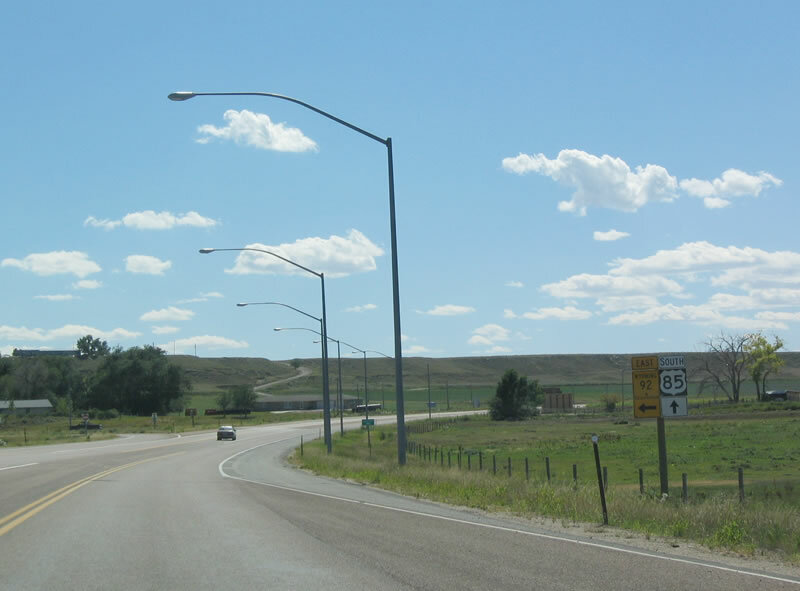 From Newcastle, U.S. 85 meets Wyoming 585 at Four Corners. Wyoming 585 heads northwest to Interstate 90 at Sundance, while U.S. 85 continues into the Black Hills. The elevation increases dramatically in the Black Hills to 6,333 feet above sea level, which is the highest point along the U.S. 85 route in Wyoming. 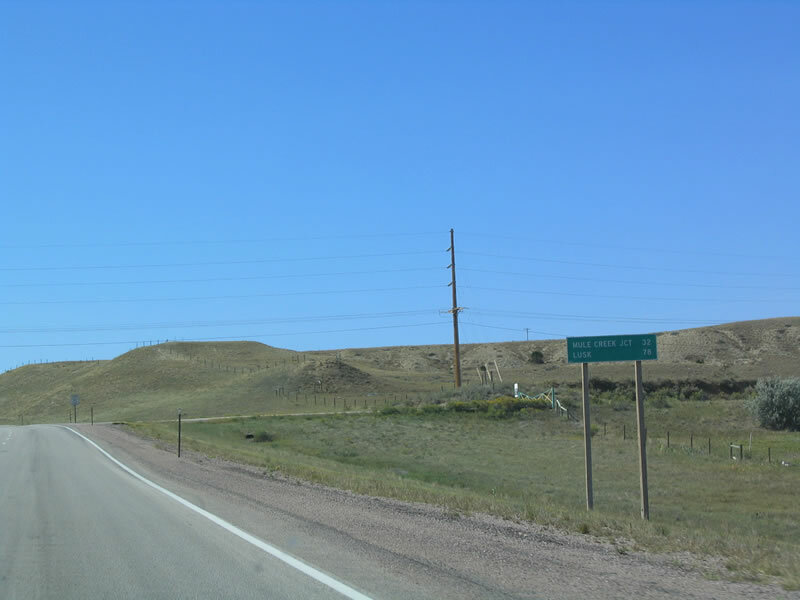 U.S. 85 continues north, via O'Neil Pass and Spearfish Canyon, to serve the western fringes of the Dakotas. It ends at the Canadian border near Fortuna, North Dakota, just north of Williston. With the exception of a brief merger with Interstate 90, U.S. 85 remains mostly rural, two-lane for the entire trip to Canada. 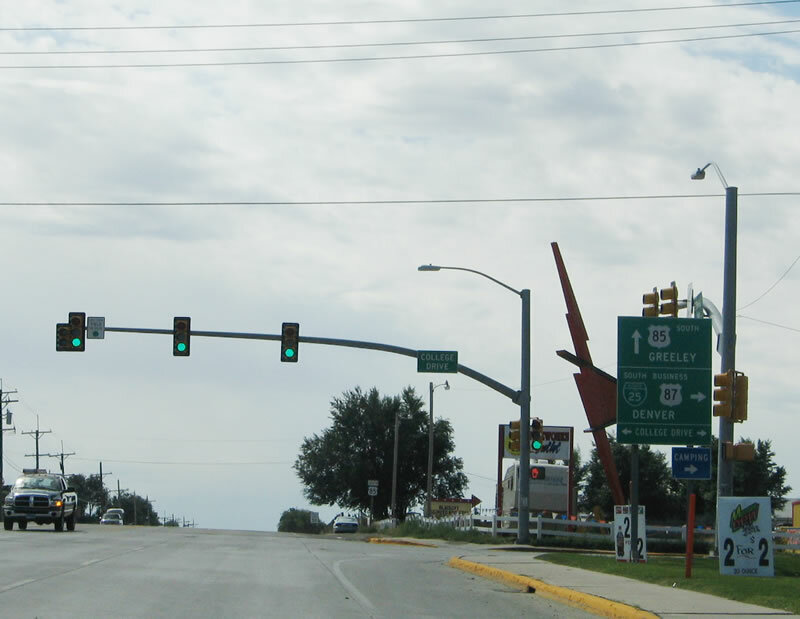 After passing College Boulevard (Wyoming 212, which acts as the circumferential route around southern, eastern, and northern Cheyenne), northbound U.S. 85 (Greeley Highway) is joined by Business Loop I-25 and Business U.S. 87 en route to downtown Cheyenne. Photo taken 02/02/02. 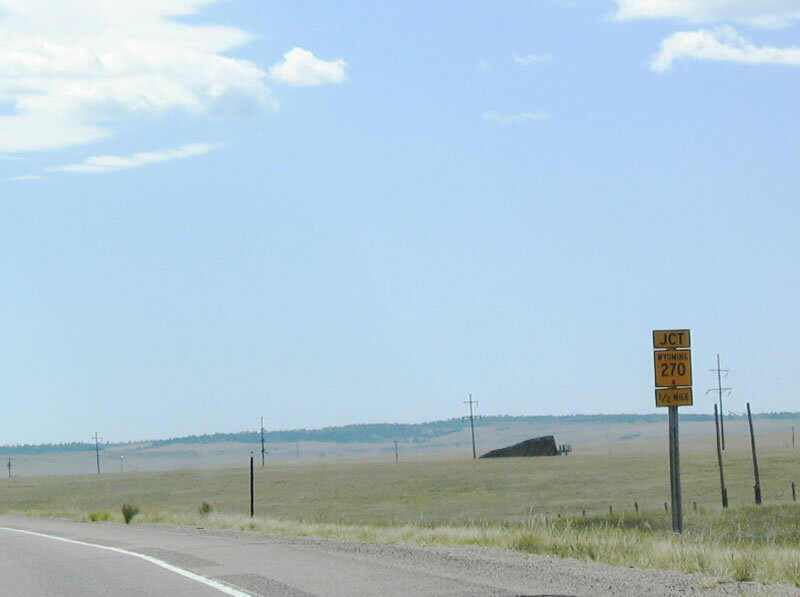 This Business Loop I-25, U.S. 85, and Business U.S. 87 shield assembly is posted on the way north to Cheyenne. Photo taken David Backlin (07/26/07). U.S. 85 changes from Greeley Highway to Central Avenue as the highway meets Fox Farm Road (Wyoming 221) just south of the Interstate 80 interchange. Take Fox Farm Road (Wyoming 221) east to Morrie Avenue and Wyoming 212. 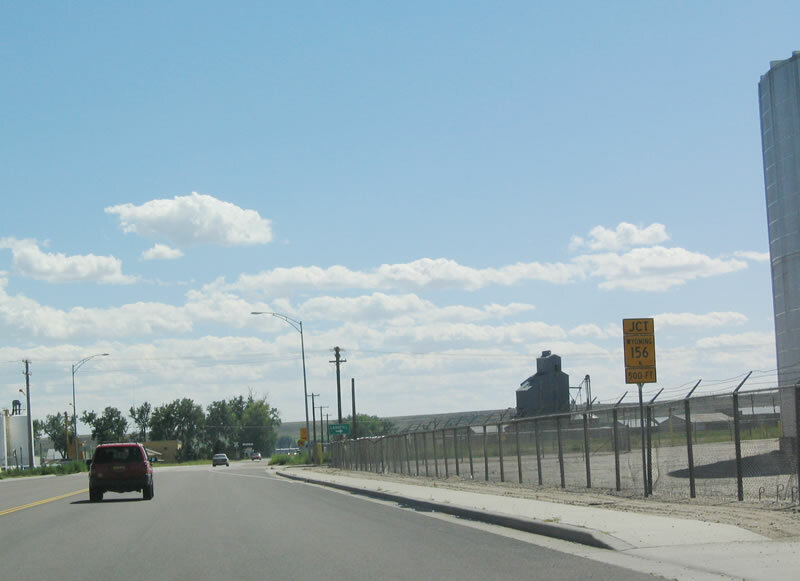 Morrie Avenue passes under Interstate 80, while Wyoming 212 follows College Boulevard around eastern Cheyenne and connects to Laramie County Community College on the southeastern corner of metropolitan area. Photo taken 02/02/02. 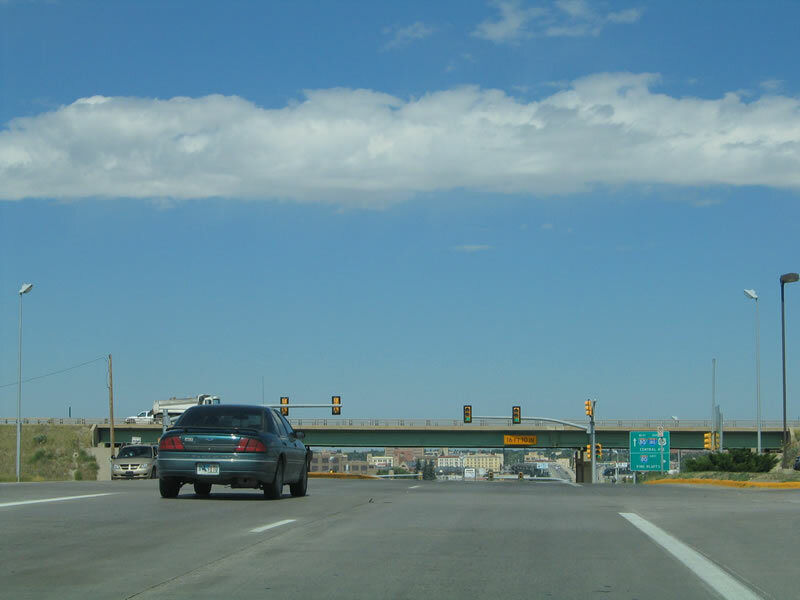 After the Fox Farm Road (Wyoming 221) intersection, northbound Business Loop I-25, U.S. 85, and Business U.S. 87 approach the junction with Interstate 80 and Interstate 180. 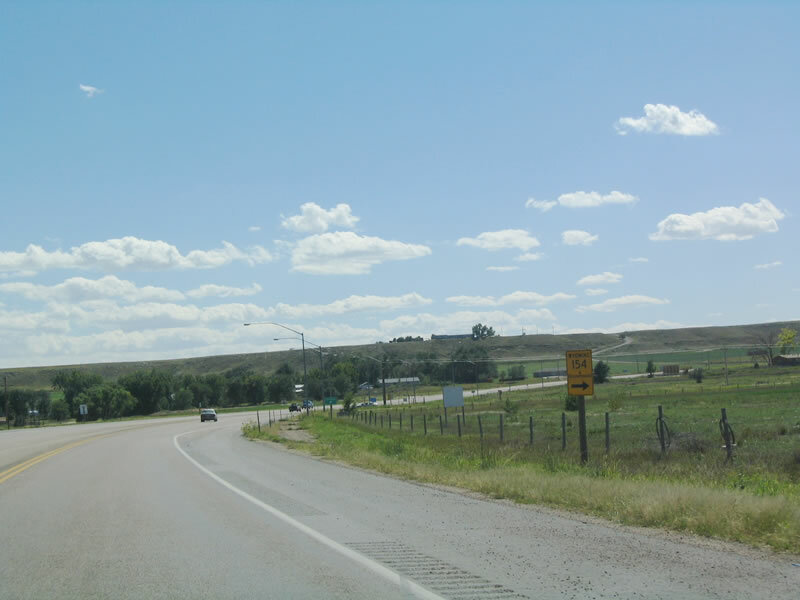 Follow Interstate 80 east to Pine Bluffs and Nebraska; follow Interstate 80 west to Interstate 25, Laramie, Salt Lake City, and points west. To the north of here, U.S. 85 picks up an additional designation: Interstate 180, which follows Central Avenue north to downtown. Even though Interstate 180 is not a freeway, it is considered an Interstate highway due to its funding source and inclusion of the mileage in the Interstate Highway System. 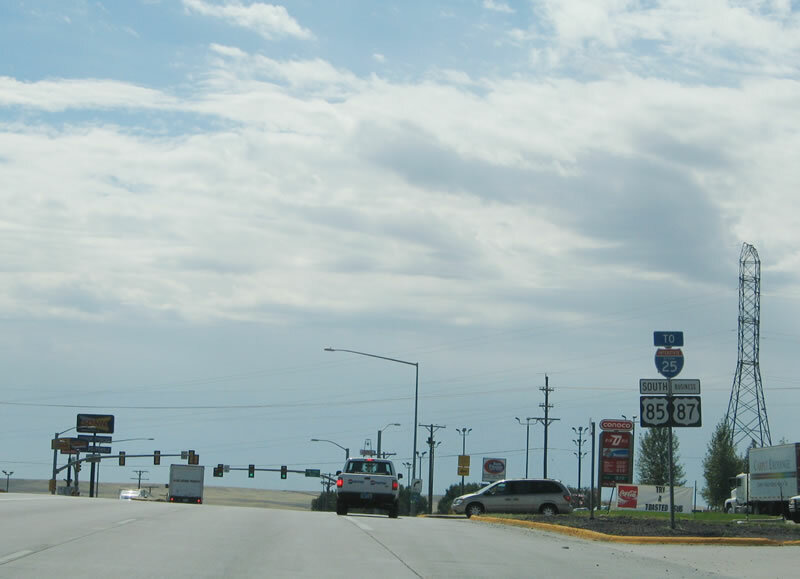 Interstate 180 ends at Business Loop I-80/Lincolnway; Business Loop I-25, U.S. 85, and Business U.S. 87 continue north along Central Avenue into northern Cheyenne. Photo taken 09/04/04. For photos, see Interstate 180. For photos, see Business Loop I-25, Cheyenne. For photos, see Interstate 25 and U.S. 87. In Lusk, this view is afforded along northbound U.S. 18-85 (Cedar Street) after U.S. 20 follows East Third Street east toward Nebraska. Ahead, U.S. 18-85 cross over the Union Pacific (Chicago and Northwestern) Railroad on a viaduct. Photo taken 09/04/04. 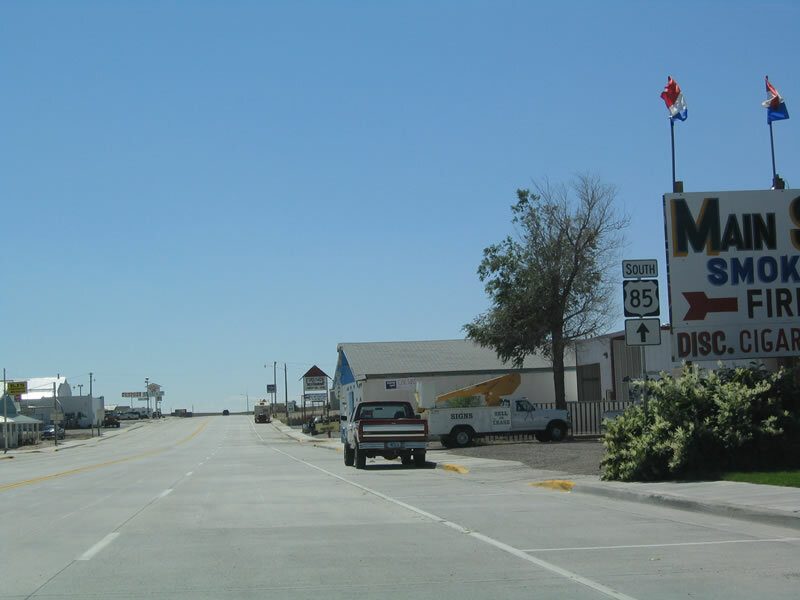 Now leaving the vicinity of Newcastle, U.S. 85 south leaves its intersection with U.S. 16 and prepares to travel south toward Mule Creek Junction and Lusk. There are not many services along U.S. 85, so be sure to obtain fuel and food before leaving the Newcastle area. Photo taken 09/04/04. When flashing, U.S. 85 south is closed. Signs like this started to appear along Interstate and primary arterial roadways in the 1990s; they are found on nearly all major routes today. Photo taken 09/04/04. As if to exacerbate the distances involved on U.S. 85, the next "settlement" is Mule Creek Junction ... and this is just a rest area at the corner of U.S. 18 and U.S. 85. The next real services are at Lusk, some 78 miles to the south of here. 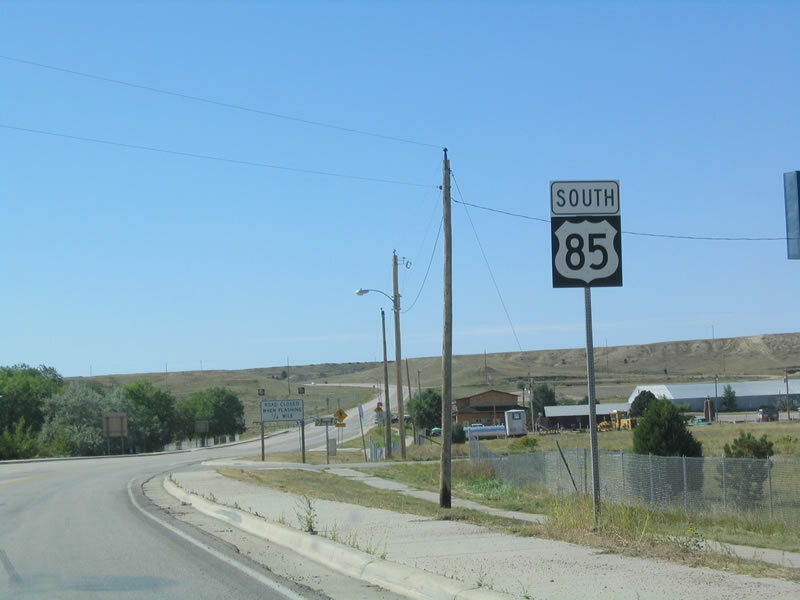 U.S. 85 leaves Weston County and enters Niobrara County prior to reaching Mule Creek Junction. Photo taken 09/04/04. Southbound U.S. 85 and westbound U.S. 18 merge together here at Mule Creek Junction. A rest area is located at the northeastern corner of the intersection, but there are no other services available here. 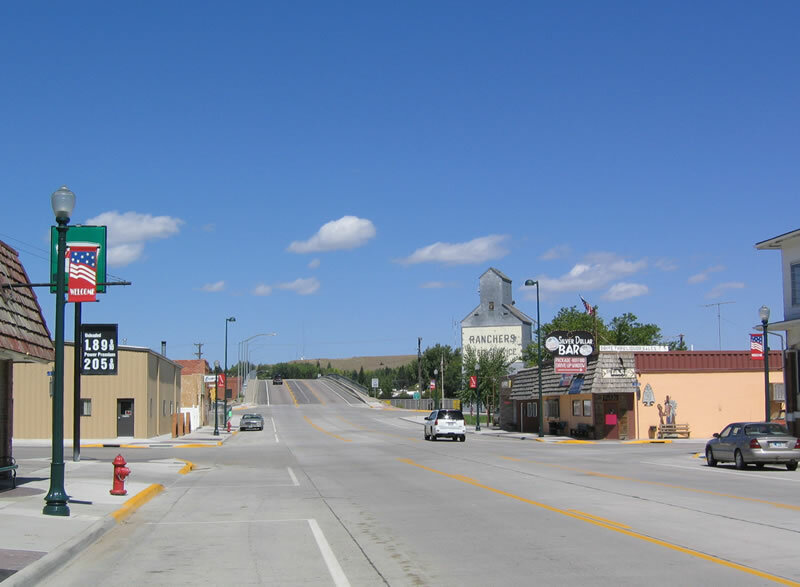 To Edgemont, South Dakota, take U.S. 18 east. In South Dakota, U.S. 18 continues east to Hot Springs, Oglala, Pine Ridge, Martin, Winner, Burke, Lake Andes, Olivet, and Canton. The highway travels through northern Iowa, and it ends in downtown Milwaukee, Wisconsin, on the shores of Lake Michigan. Photo taken 09/04/04. U.S. 18 is cosigned superfluously with U.S. 85 between Mule Creek Junction and Lusk. 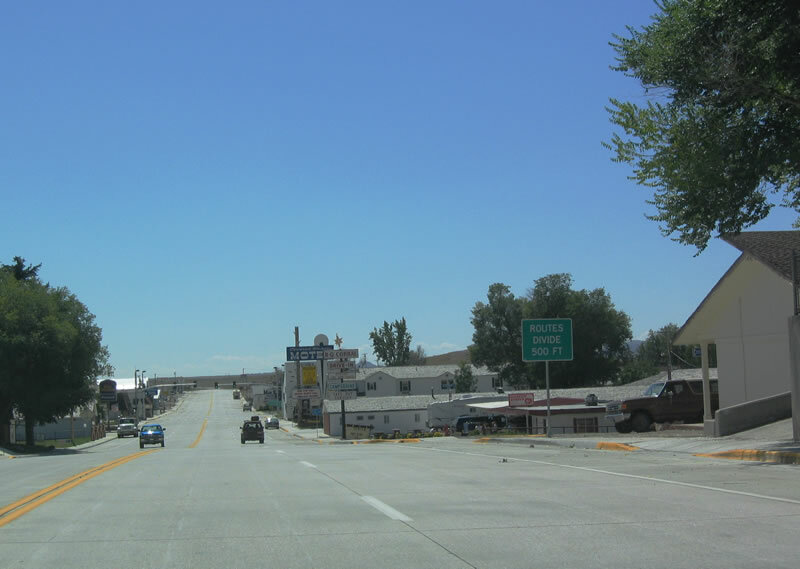 U.S. 18 could end at Mule Creek Junction, but since that endpoint is so far removed from anywhere, it was decided in 1968 to extend U.S. 18 to Orin Junction, where the highway meets Interstate 25. Note the CanAm Highway trailblazer shield posted below U.S. 85 and U.S. 18. Photo taken 09/04/04. For the first time on southbound U.S. 85, Torrington appears as a control point some distance south of Lusk. Lusk is 46 miles south of here, and Torrington is 103 miles south of here. Photo taken 09/04/04. 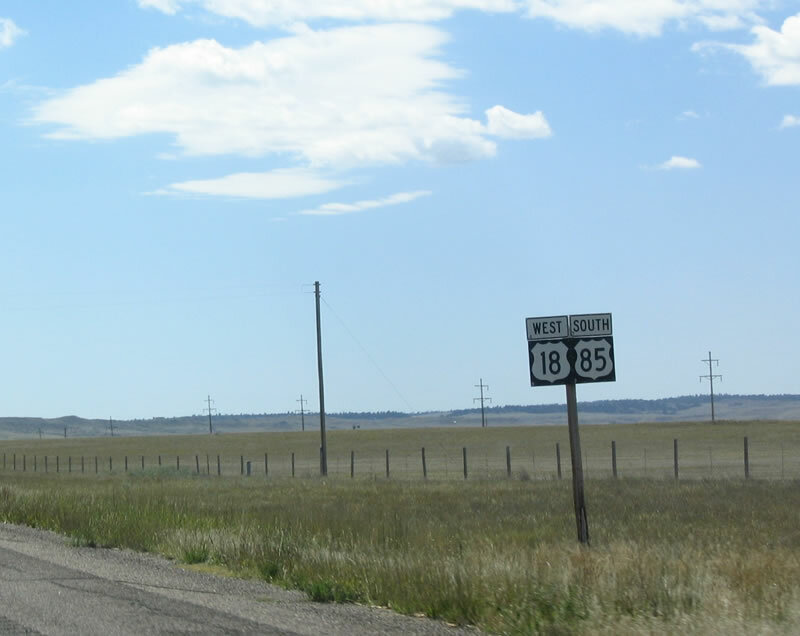 South of Mule Creek Junction and Redbird, U.S. 18-85 south approaches Wyoming 270 west to Lance Creek. Photo taken 09/04/04. 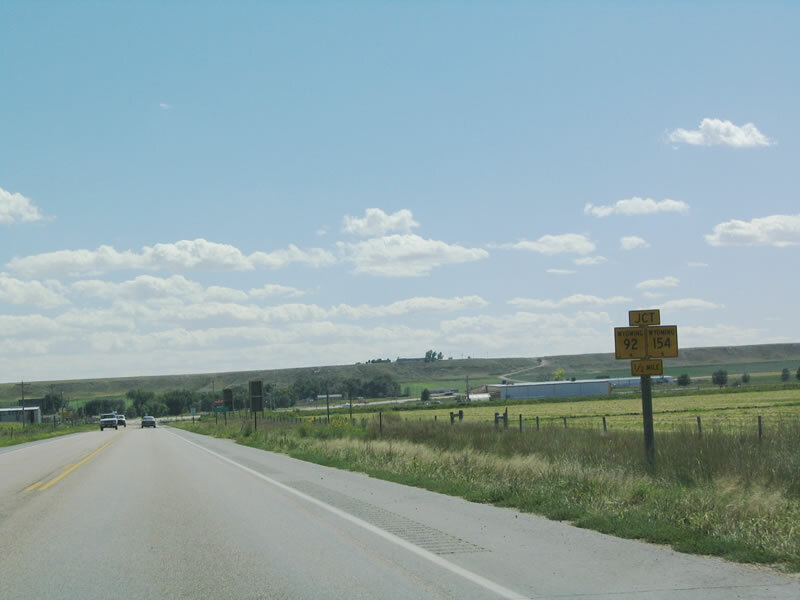 Wyoming 270 travels west to Lance Creek, then turns south through Manville in Niobrara County. Crossing into Platte County, Wyoming 270 passing through Hartville (Wyoming 318) before ending at U.S. 26 just east of Guernsey. The route acts as an alternative to U.S. 85 for a faster connection to Interstate 25 via U.S. 26. Photo taken 09/04/04. U.S. 18-85 are cosigned again on this shield assembly after the Wyoming 270 intersection east of Lance Creek. 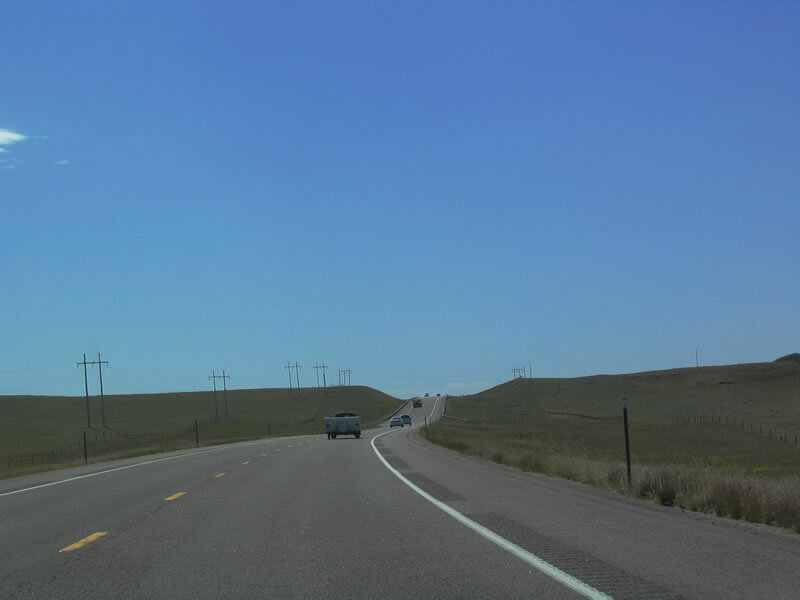 The highway continues to follow the Cheyenne-Deadwood Stage Road south to Lusk, but the routes diverge there. The stage road will angle southwest toward Wheatland, while U.S. 85 will turn southeast to serve Lingle and Torrington. Photo taken 09/04/04. 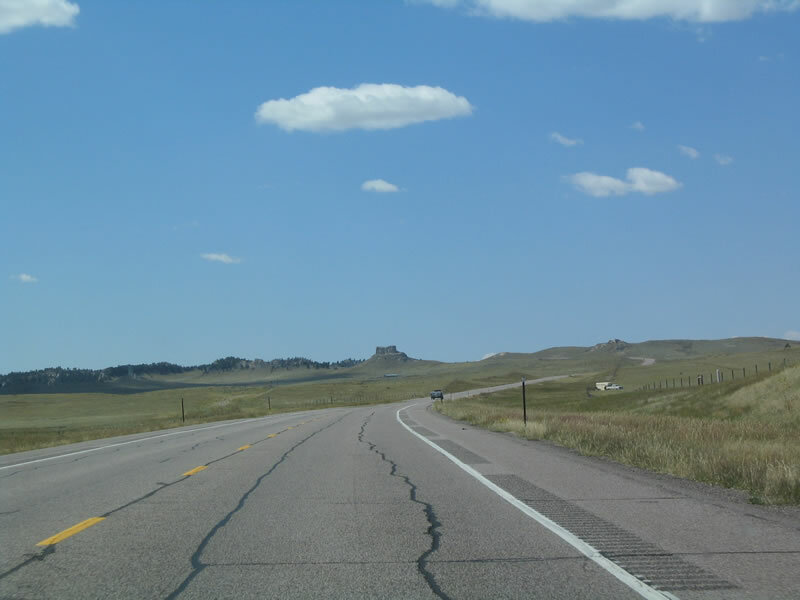 Scenery to the west of U.S. 18-85 is reminiscent of the Black Hills as the highway continues to drive south toward Lusk. Photo taken 09/04/04. 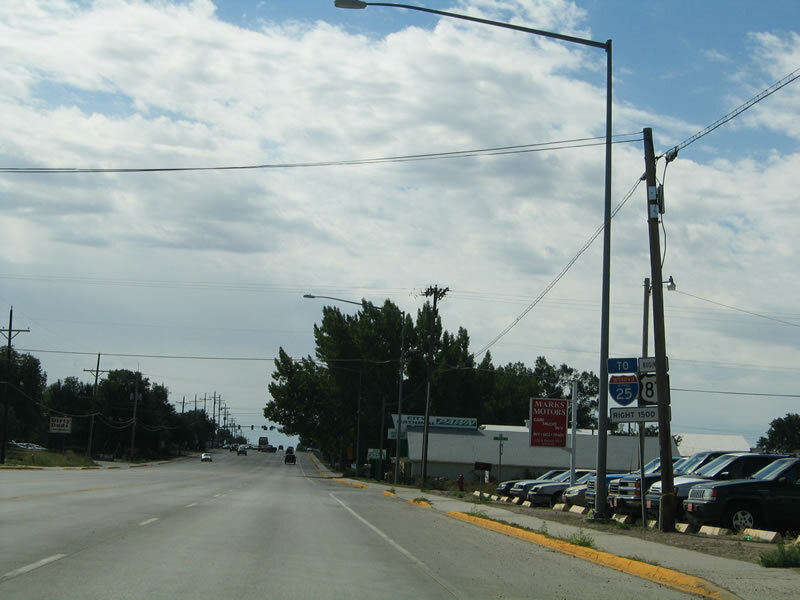 Standard H-frame power poles convey electricity toward Lusk. Photo taken 09/04/04. Lusk is the "Crossroads of the West." 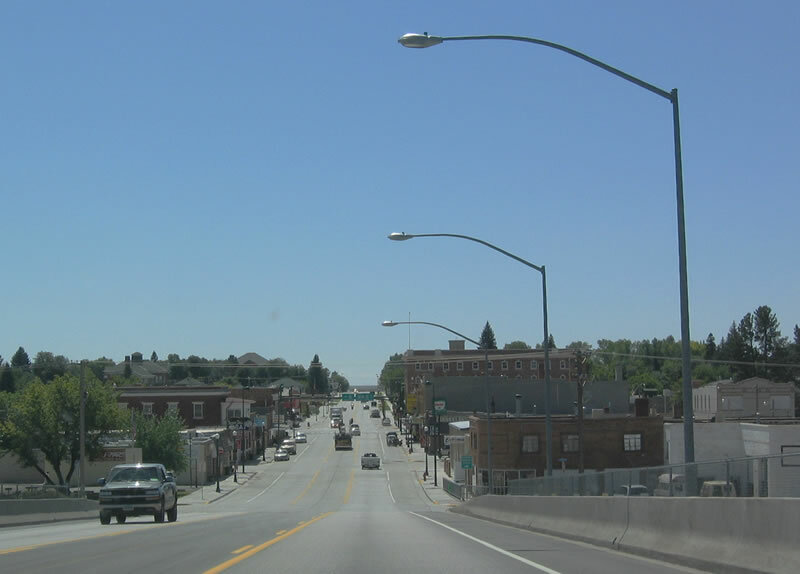 In addition to the U.S. highways (18, 20, 85), the Union Pacific Railroad passes through town. Both the Cheyenne and Black Hills Trail and Texas Trail ran through Lusk, and historical markers are posted along the routes of these trails. Recently (late 1990s/early 2000s), Lusk was the feature of news stories touting that the entire town is wired for the Internet. Photo taken 09/04/04. Southbound U.S. 18-85 approaches Niobrara County Route 69, Kaltenhauser Road. 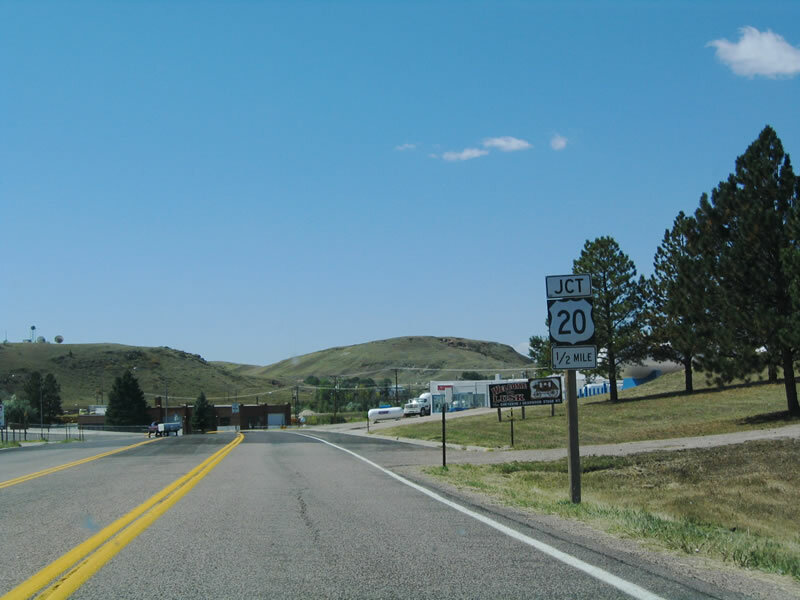 The county route provides an alternative route to U.S. 20, connecting with eastbound U.S. 20 at Node via southbound Niobrara County Route 80 (Node Road). Photo taken 09/04/04. As of the 2000 Census, 1,447 people reside in Lusk, which serves as the seat to Niobrara County. 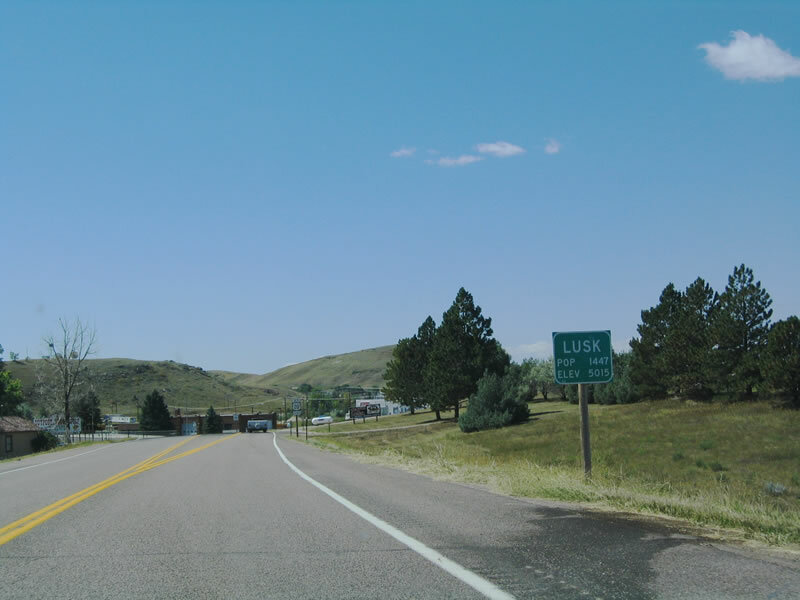 In addition to its status as a gateway to several regional attractions such as the Black Hills, Lusk is also home to the Wyoming Women&apos;s Center, which functions as the state correctional facility for women. The main state correctional facility is located in Rawlins in Carbon County. Photo taken 09/04/04. Southbound U.S. 18-85 approaches transcontinental route U.S. 20. U.S. 20 travels east from Lusk into northern Nebraska, and it gains importance and traffic as it passes through northern Iowa and northern Illinois toward Chicago. The U.S. highway follows the industrial corridor between Chicago and Cleveland, passes through upstate New York, and ends in Boston, Massachusetts. Photo taken 09/04/04. A viaduct carries U.S. 18-85 over the Union Pacific Railroad. 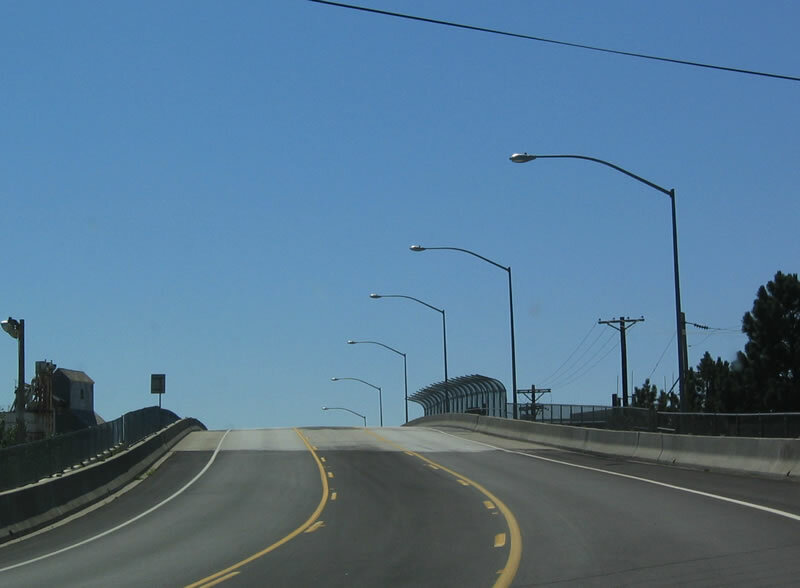 Inexplicably, the middle turn lane remains in place as the highway ascends the bridge. Photo taken 09/04/04. Downtown Lusk spreads out on southbound U.S. 18-85 as the highway descends from the railroad viaduct. A city at 5,015 feet, U.S. 85 will lose elevation upon reaching the North Platte River Valley (Lingle and Torrington), and then it will gain elevation to reach Cheyenne at elevation 6,062 feet. Photo taken 09/04/04. 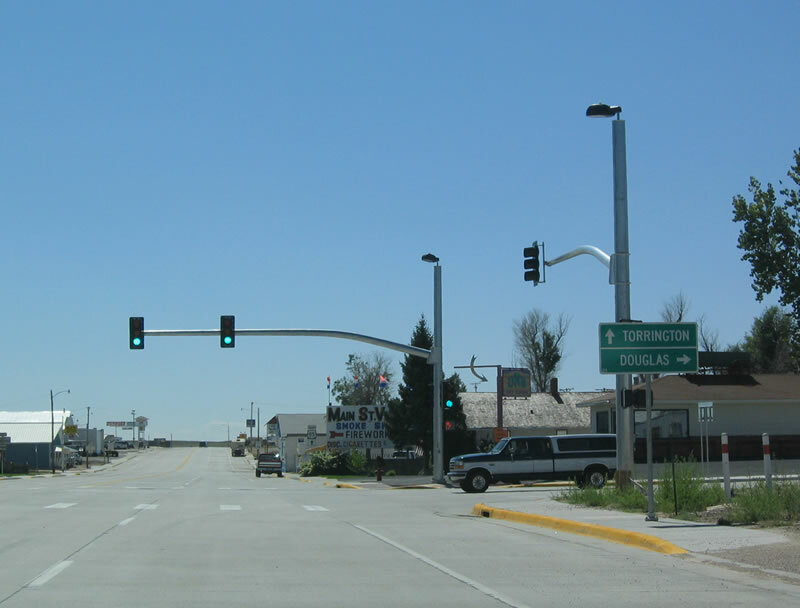 Southbound U.S. 18-85 reaches its junction with U.S. 20, which follows Third Street east toward Van Tassell and Chadron, Nebraska. The three U.S. routes follow Cedar Street south through the remainder of downtown Lusk. Photo taken 09/04/04. A few motels and restaurants line U.S. 18-20-85 on the brief overlap. However, the routes divide only a short distance south of downtown Lusk. Photo taken 09/04/04. 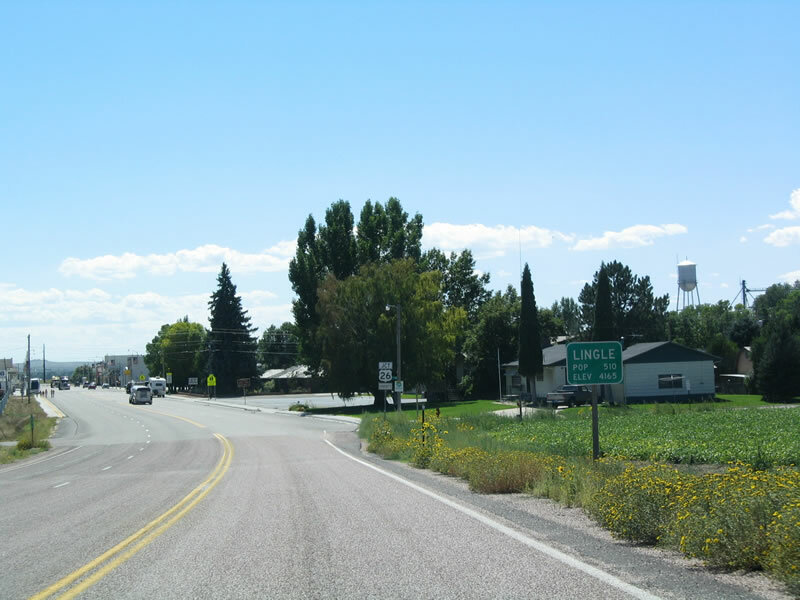 U.S. 18-20 turn west toward Orin Junction, where the routes meet Interstate 25 and U.S. 26-87. 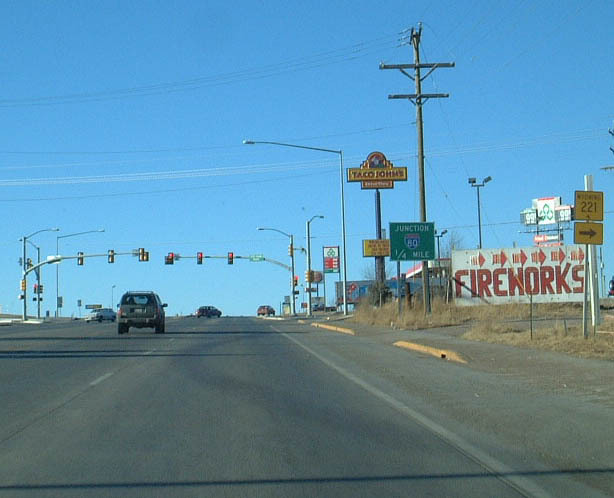 U.S. 18 ends at this junction; U.S. 20 joins Interstate 25 northbound en route to Douglas, Glenrock, and Casper. Photo taken 09/04/04. Continue south on Cedar Street to follow U.S. 85/CanAm Highway south to Lingle, Torrington, and Cheyenne. Turn right onto West Eighth Street/U.S. 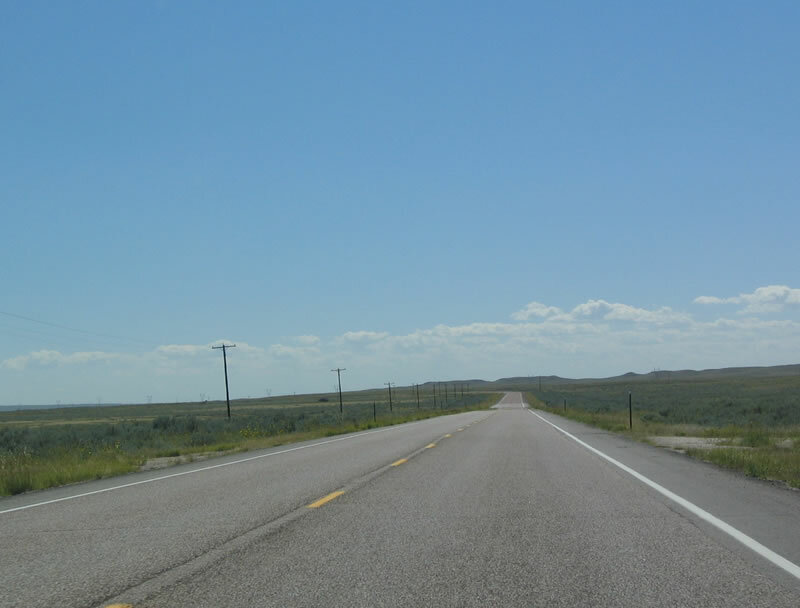 18-20 to reach Douglas, Casper, and all points in Western Wyoming (via U.S. 20-26 or Wyoming 220). 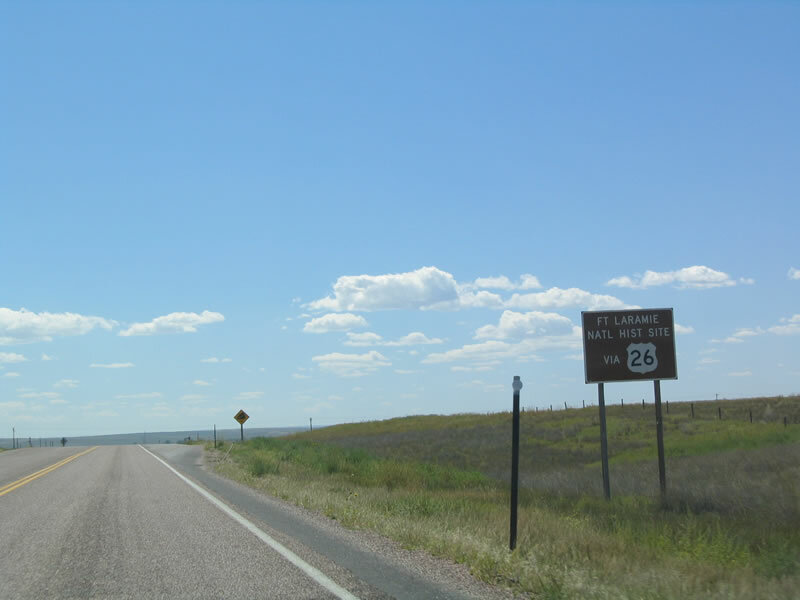 To Laramie, follow U.S. 18-20 west to Interstate 25 south, and exit Wyoming 34 southwest. Photo taken 09/04/04. After U.S. 18-20 split to the west, U.S. 85/CanAm Highway flies solo to carry traffic from Lusk south to Lingle, Torrington, and Cheyenne. Photo taken 09/04/04. 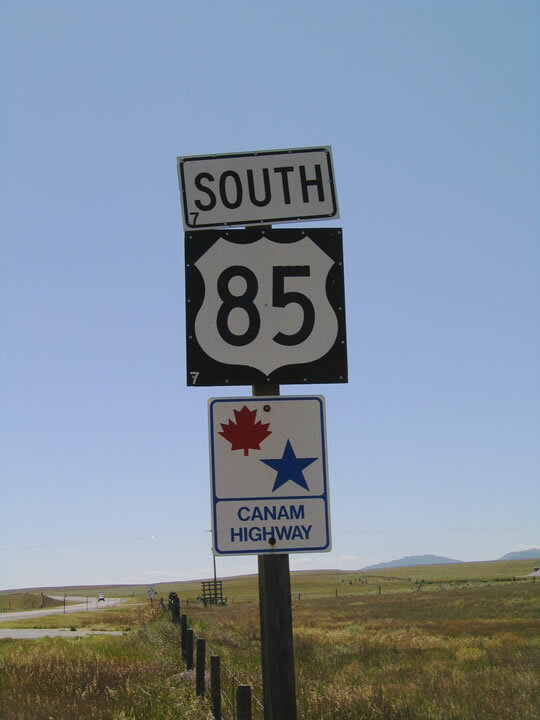 U.S. 85 is cosigned with a CanAm Highway shield on this shield assembly south of Lusk. Photo taken 09/04/04. A "suicide lane" governs passing on this section of U.S. 85 south of Lusk and north of Lingle. This situation occurs when either direction of traffic may use the middle lane for passing, which can create a dangerous situation if the passing cars do not notice each other as they collide. Photo taken 09/04/04. Most of the route between Lusk and Lingle is a two-lane highway, with passing allowed where sight distances permit. 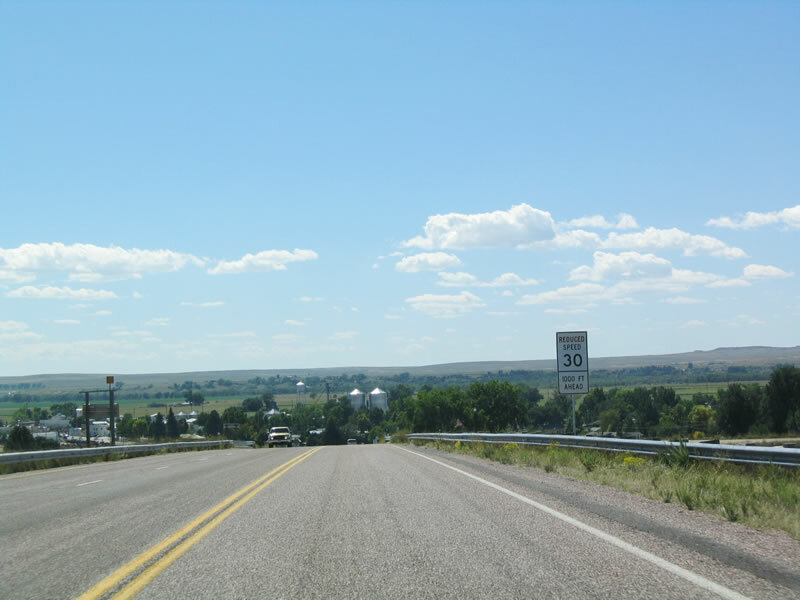 The highway's traffic counts are low to moderate, with the settlement of Jay Em being the only change in the scenery between Lusk and Lingle. South of Lusk, U.S. 85 leaves Niobrara County and enters Goshen County. Photo taken 09/04/04. Settled in 1834 and a military fort between 1849 and 1890, Fort Laramie is located on the south bank of the North Platte River west of Lingle. The fort was part of the frontier, with those participating in the Gold Rush of 1849 passing by on their way to California. During the "Great Sioux War," the fort served as a military headquarters. Today the site is preserved as a national historic site, accessible via U.S. 26 west to Wyoming 160 west to the park headquarters. Photo taken 09/04/04. After cresting a hill, U.S. 85 south enters the North Platte River valley and descends into Lingle. Unlike the miles of sagebrush that has dominated U.S. 85 south of Lusk, agriculture and ranching become part of the horizon. Photo taken 09/04/04. As of the 2000 Census, 510 people call the town of Lingle home. U.S. 85 converges with U.S. 26 here in Lingle, and the two routes will merge for their joint distance to Torrington, the seat of Goshen County. Photo taken 09/04/04. 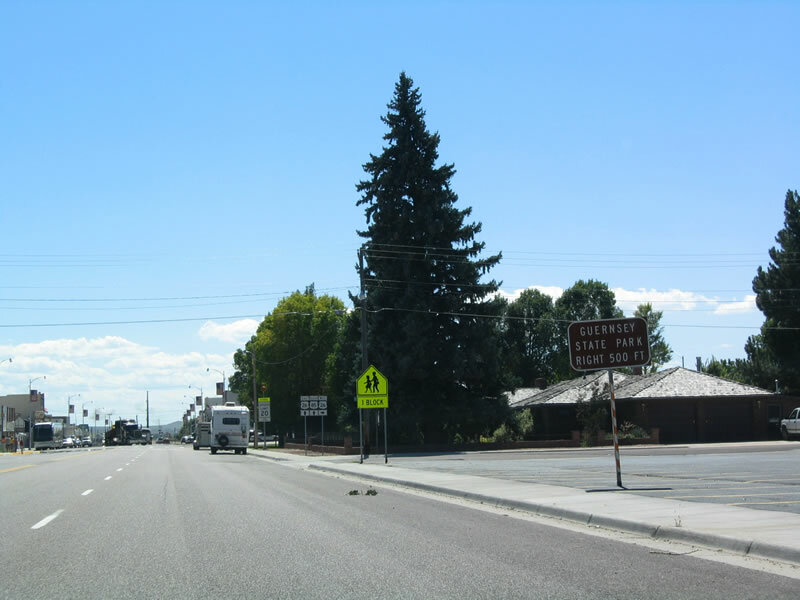 While the advance signage for U.S. 26 is in the sagebrush, the irrigated lawns of Lingle lay only a short distance south. U.S. 85 becomes Main Street, while U.S. 26 west follows West Fourth Street toward Guernsey. Photo taken 09/04/04. Guernsey State Park is located west of Lingle on U.S. 26. Follow U.S. 26 west to Guernsey, then follow Wyoming 317 north into the park, which rests on the south side of Glendo Reservoir. Camping, hiking, photography, and swimming are all available. Photo taken 09/04/04. South U.S. 85 and east U.S. 26 merge together onto Main Street. The two routes follow the north bank of the North Platte River en route to Torrington. Photo taken 09/04/04. For photos, see U.S. 26. U.S. 85 south and Wyoming 92 east are briefly cosigned south of Torrington. Photo taken 09/04/04. Wyoming 156 is an alternative to U.S. 26-85; it follows the south bank of the North Platte River between Torrington and Lingle. Photo taken 09/04/04. 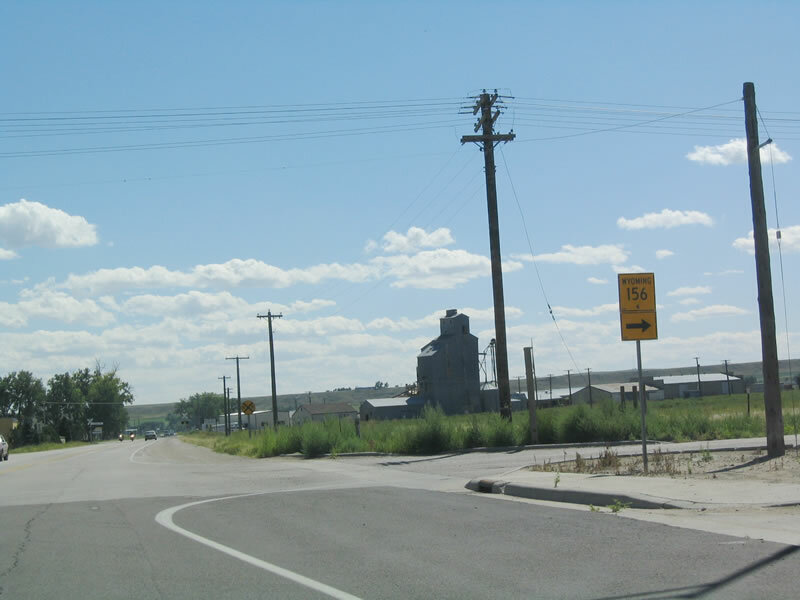 Southbound U.S. 85 and eastbound Wyoming 92 reach the intersection with Wyoming 156 just north of a railroad crossing. Photo taken 09/04/04. U.S. 85 and Wyoming 92 prepare to split shortly after crossing the North Platte River. 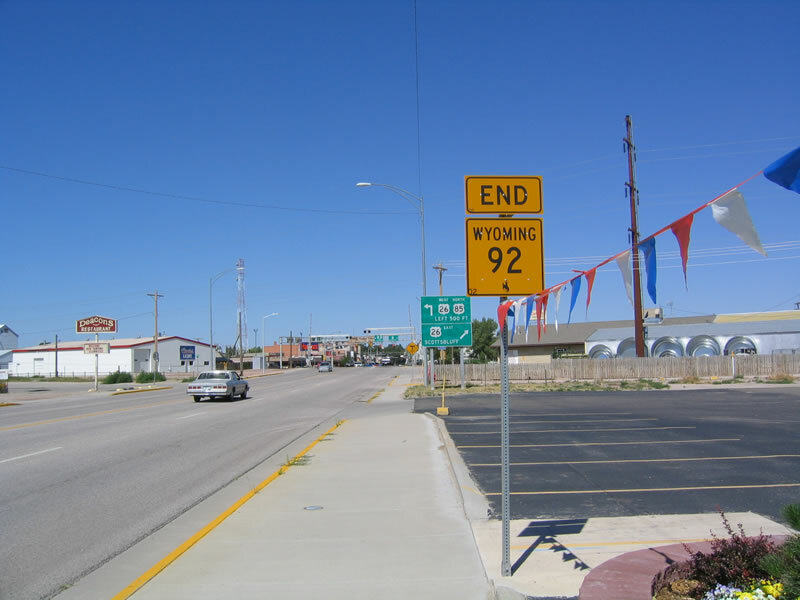 Wyoming 92 travels into Nebraska, where it becomes Nebraska 92. The same route number extends across four states, with the route ending in La Moille, Illinois at U.S. 34. Wyoming 154 turns west from this area toward Veteran, while Wyoming 92 travels toward Huntley. Photo taken 09/04/04. Wyoming 154 is a longer alternate route to U.S. 85, traveling west to Veteran and then turning south to Yoder and then turns east back to U.S. 85. Photo taken 09/04/04. Wyoming 92 generally parallels U.S. 26 on the south side of the North Platte River as the river trends southeast into Nebraska. Once in Nebraska, Nebraska 92 generally stays to the south of the river until U.S. 26 turns southeast toward Ogallala, Nebraska; Nebraska 92 follows the north shore of Lake McConaughey. From there, the route turns north along Nebraska 61, then turns east, serving Arthur, Tryon, Stapleton, Broken Bow, Loup City, St. Paul, Osceola, and Wahoo before entering the Omaha metropolitan area. Photo taken 09/04/04. Continuing south after the Interstate 80 interchange, southbound Business Loop I-25/U.S. 85-87B approaches Fox Farm Road (Wyoming 221). 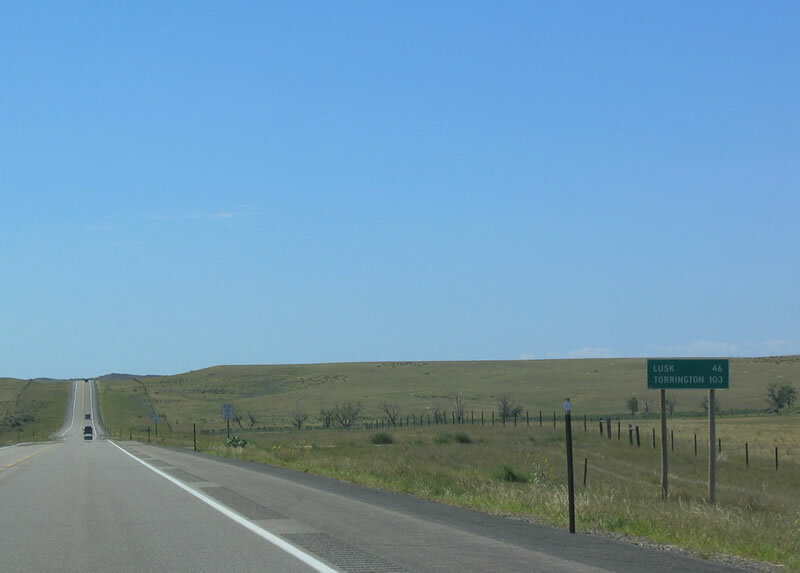 This secondary state route travels east from Greeley Highway to meet College Drive (Wyoming 212) on an alignment roughly parallel to Interstate 80 between Exits 362 and 364. Photo taken 09/04/04. 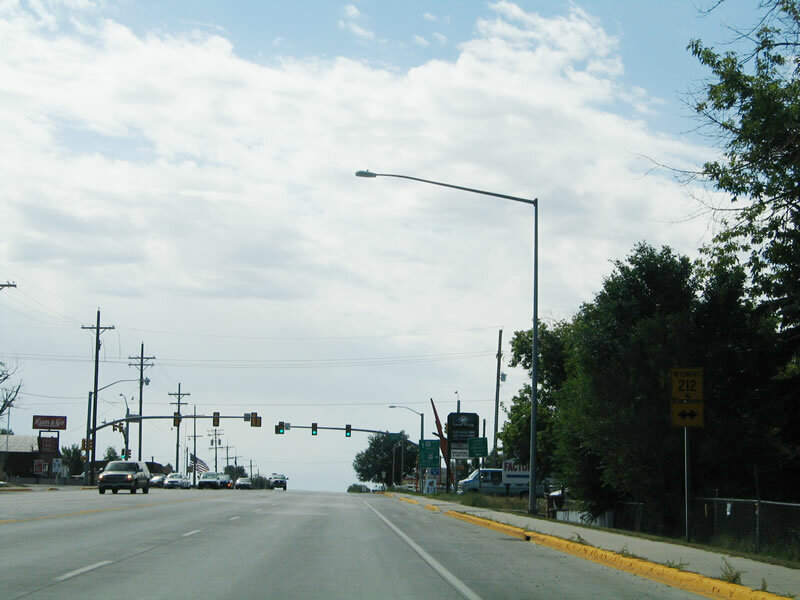 The business loop is now signed as "To Interstate 25" rather than with a green business shield. 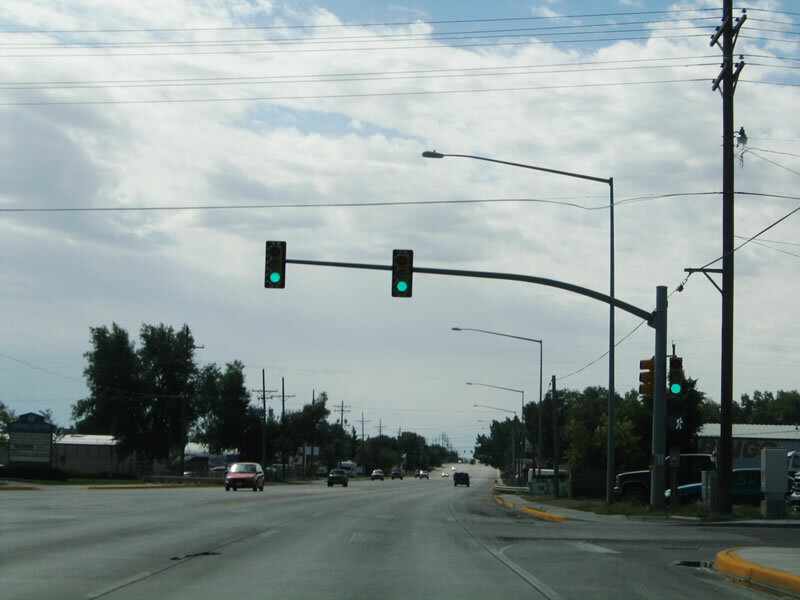 While this is a fairly common method of signing such routes in Wyoming, it makes it harder to follow business loops. Photo taken 09/04/04. Another Wyoming 221/Fox Farm Road trailblazer shield is posted along southbound Business Loop I-25 and U.S. 85-87B. Photo taken 09/04/04. Southbound Business Loop I-25 and U.S. 85-87B reaches Wyoming 221, Fox Farm Road. 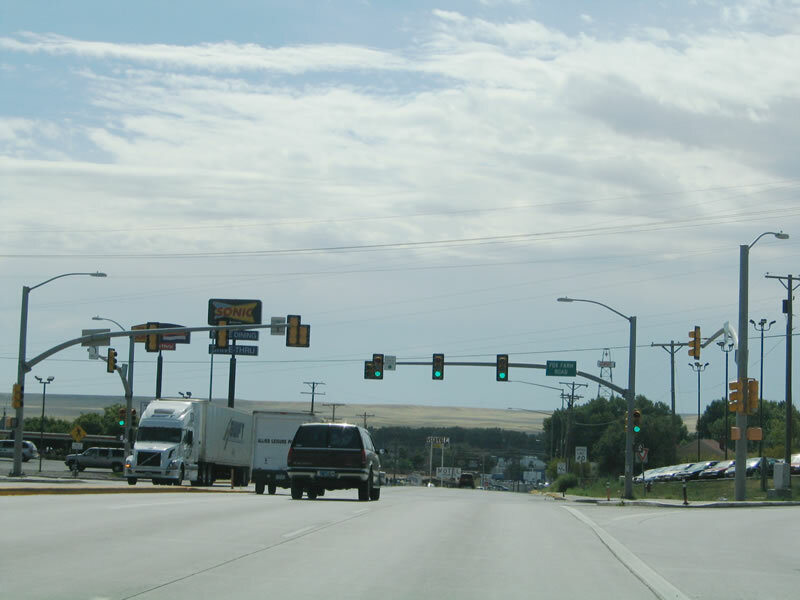 The business route continues south along Greeley Highway into southern Cheyenne. Photo taken 09/04/04. After Fox Farm Road, southbound Business Loop I-25 and U.S. 85-87B follow a five-lane alignment along Greeley Highway. Photo taken 09/04/04. The three routes prepare to divide at College Drive. Business Loop I-25 (signed as To Interstate 25 here) and Business U.S. 87 turn right onto College Drive (Wyoming 212). U.S. 85 continues south into Colorado. Photo taken 09/04/04. 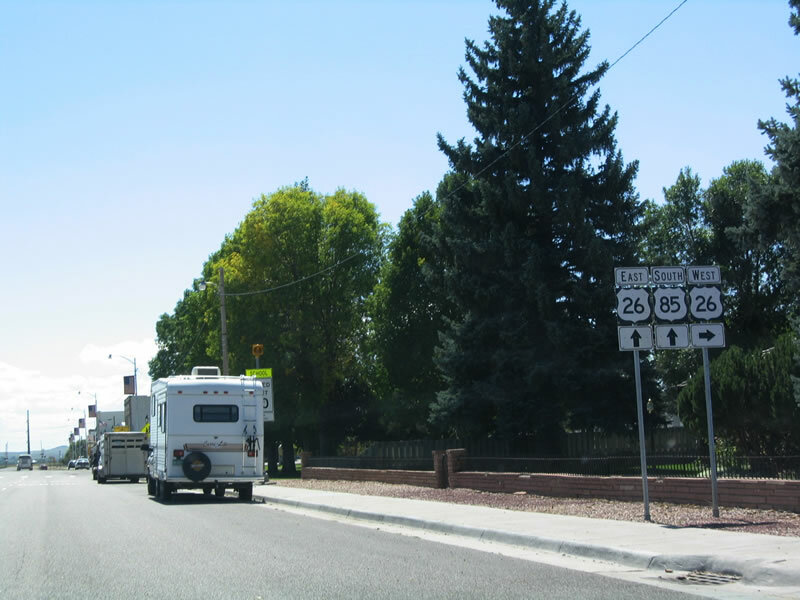 Wyoming 212 serves as the partial circumferential route around Cheyenne. 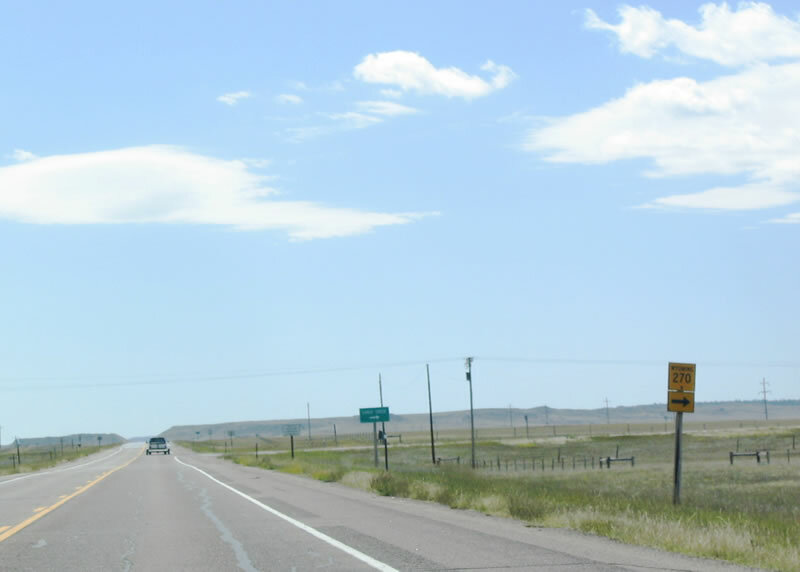 Named College Drive due to the connection to Laramie County Community College, Wyoming 212 travels east from Interstate 25, turns north to form a boundary to the east of the city, and turns west again along Four Mile Road. Wyoming 212 meets its end at Wyoming 219 (Old U.S. 85-87) north of Cheyenne. Most of the route is two lanes, but there are multilane sections. Photo taken 09/04/04. While Wyoming 212 travels east-west here, Business Loop I-25 and Business U.S. 87 turn west to follow Wyoming 212 back to Interstate 25 and U.S. 87. Photo taken 09/04/04. Turn right to follow Business Loop I-25, Business U.S. 87, and Wyoming 212 west to Interstate 25. 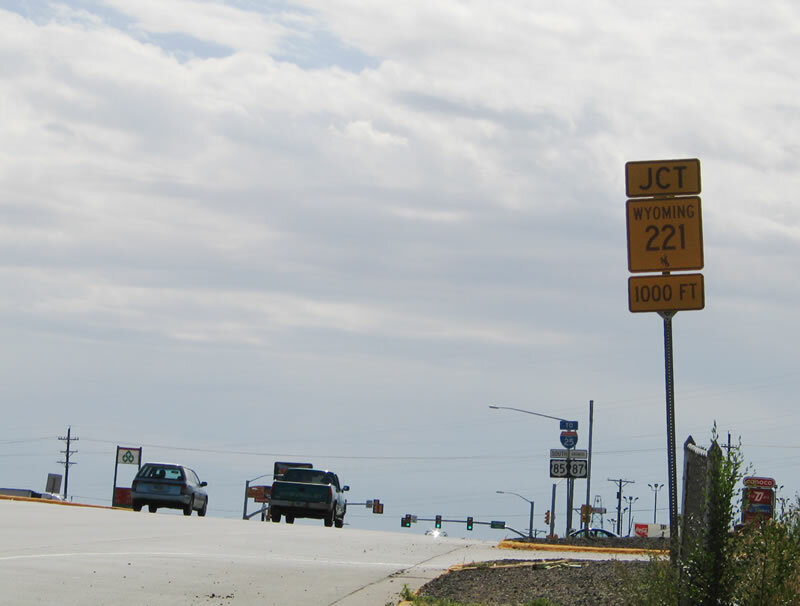 Turn left to reach Laramie County Community College via Wyoming 212. Continue south on U.S. 85 toward Greeley, Colorado, and points south along the U.S. 85 corridor. Photo taken 09/04/04. Wyoming 92 ends at the intersection between U.S. 26-85/East Valley Road and Business U.S. 85/Main Street in Torrington. 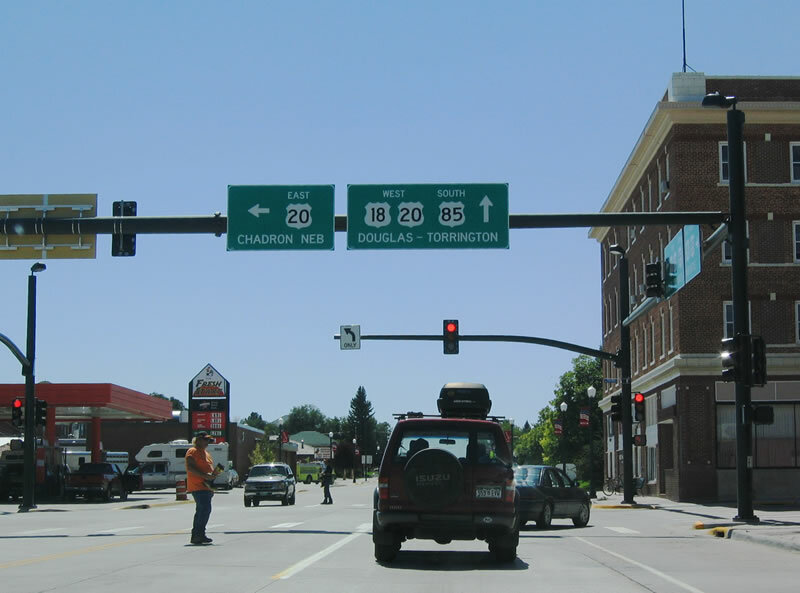 The end of this multi-state route is well signed as Business U.S. 85 and Wyoming 92 follow Main Street into Torrington from the south. Photo taken 09/04/04. 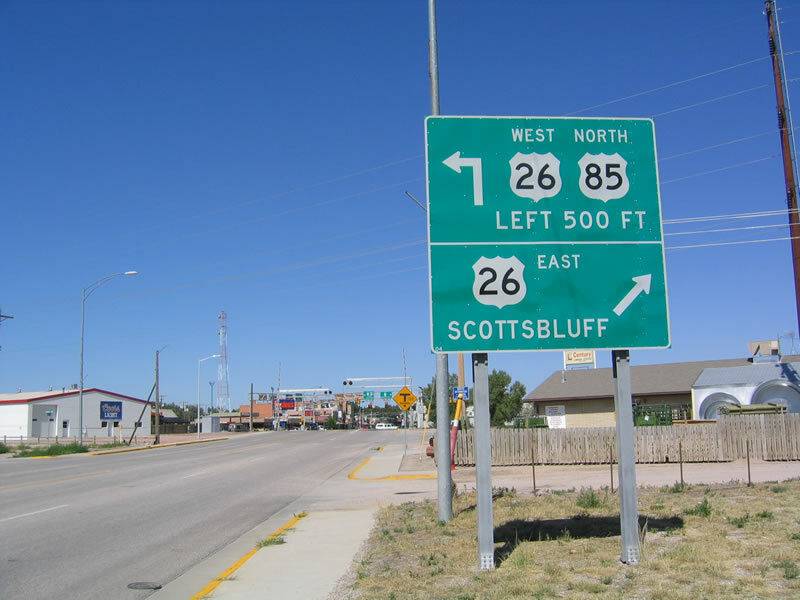 Follow U.S. 26-85 east to Scottsbluff; turn left to follow U.S. 26-85 west to follow the North Platte River toward Lingle. At Lingle, U.S. 26 continues west toward Glendo Reservoir and Douglas; U.S. 85 angles north toward Lusk and the Black Hills Region. Photo taken 09/04/04. Northbound Business U.S. 85 reaches its junction with U.S. 26. 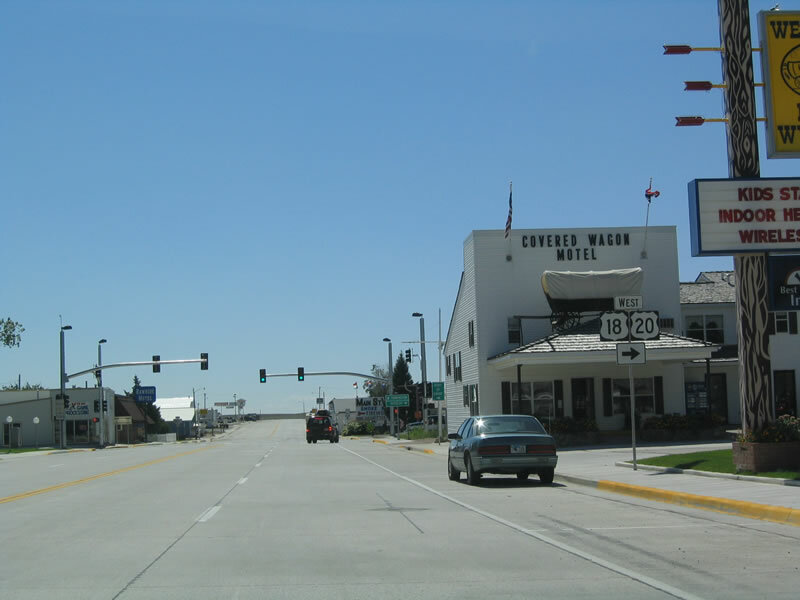 Established in 1926, U.S. 26 was originally intended to connect U.S. 30 in Ogallala, Nebraska, with U.S. 185 (now U.S. 87) west of Guernsey. With a major expansion across Wyoming in 1950 and to near Idaho Falls in 1951, U.S. 26 was fully extended to Seaside, Oregon, in 1952 (with an overlap with U.S. 101 north to Astoria). 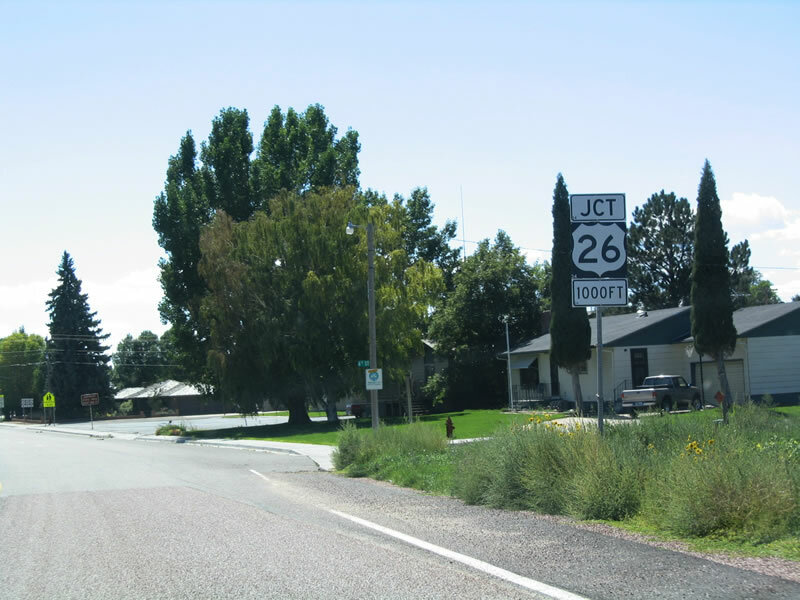 Aside from a retraction of the western end from Astoria to Seaside in 2004, U.S. 26 has remained unchanged ever since. Photo taken 09/04/04. 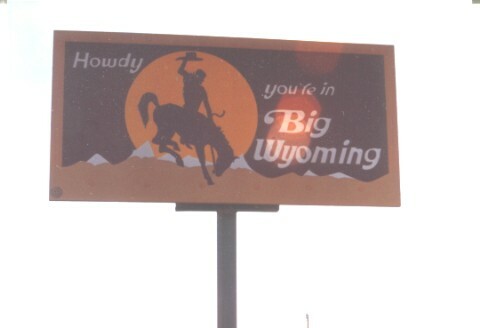 This billboard -- which stated, "Howdy, You're in Big Wyoming" -- was located along northbound U.S. 85 just across the Colorado-Wyoming State Line. Photo taken 08/98. 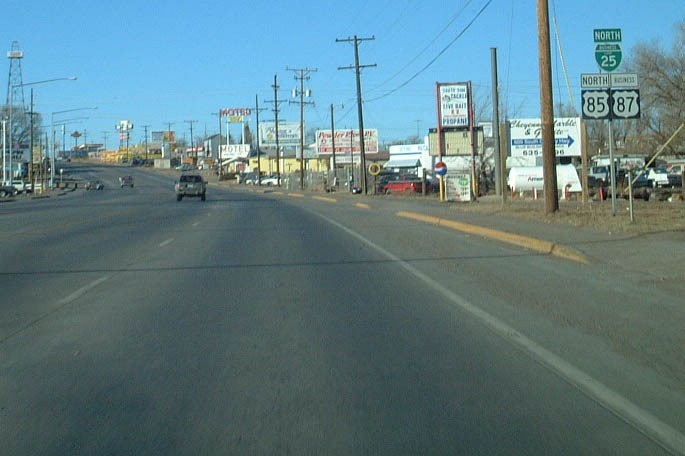 An old alignment of U.S. 85 is visible parallel to the modern Greeley Highway adjacent to the divided highway segment. The power lines help to locate the original segment of U.S. 85. Photo taken 8/98. This monument sign is located in the "front yard" of the Mule Creek Junction Rest Area at the intersection of U.S. 85 and U.S. 18. The F-229 and S-203 likely refer to the federal aid primary designations of the two routes. Photo taken 09/04/04. Page Updated September 11, 2014.